Photovoltaic cells with efficiencies at the higher end of the spectrum are expensive due to high materials costs. Cells made with single crystalline silicon have demonstrated efficiencies of 24%, but the cost of fabrication of single crystals that are then sawed into wafers of a few hundred microns in thickness is high (nearly 50% of the module costs). Cells based on III-V compounds have exhibited efficiencies of about 40%, but have found only limited use because of their cost, which is primarily driven by the high cost of single crystal substrates. Additionally, multi-junction or tandem cells which have resulted in high efficiencies in both Si and III-V compounds have been viable only with single crystalline individual cells . On the other end of the spectrum, thin film solar cells offer advantage of low-cost fabrication, but have not yielded the higher efficiencies of single crystalline cells. In poly silicon films for instance, grain boundaries have been problematic due to recombination of charge carriers . Large grain sizes similar to that in bulk multicrystalline cells have been desired and demonstrated in the range of tens of micrometers , but there has not been any path pursued to achieve of grain sizes in the order of a centimeter. Misfit dislocations at high angle grain boundaries have been identified as traps to charge carriers reducing the open circuit voltage  and initial attempts have been made to fabricate thin films with low angle grain boundaries . However, to our knowledge there has been no published attempt of single crystalline photovoltaic thin films on polycrystalline substrates or lattice mismatched substrates. In III-V compounds in particular, the need for single crystalline quality films is critical, and there is hardly an understanding of the science of defect generation and propagation and their influence on photovoltaic properties when grown on substrates other than single crystals. Hence, achievement of single crystalline III-V thin film photovoltaics on polycrystalline/lattice mismatched substrates concomitantly with a low density of defects can be game-changing in the photovoltaic research arena by combining high efficiency with low cost. The overarching objective of our program is to identify, investigate and control key elements of science to eventually enable a roll to roll processing of inexpensive ultra-high efficient III-V thin film photovoltaics on inexpensive, flexible polycrystalline, substrates. We are working on a process method to achieve single crystalline epitaxial photovoltaic thin films on polycrystalline and lattice mismatched substrates with a specific objective of studying the interfacial properties and minimizing sources of defect creation due to lattice mismatch, strains, structural and chemical mismatch and develop a comprehensive understanding of the impact of these parameters on structural, electronic and photovoltaic properties of subsequently deposited epitaxial thin film GaAs-based heterostructures. The program builds upon the existing knowledge base at University of Houston on synthesis and understanding of near-single crystalline epitaxial thin films on polycrystalline, flexible, lattice-mismatched substrates and an established heritage in the synthesis and understanding of high efficiency homoepitaxial and heteroepitaxial (i.e on Ge and Si substrates) III-V solar materials and devices. An enabler in the thin film multilayer architecture proposed in this program is biaxially-textured template made by ion beam assisted deposition (IBAD) . 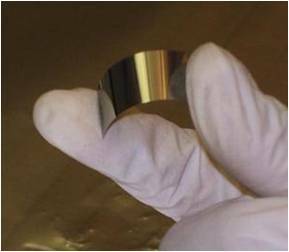 IBAD has been very successfully developed and used for high quality, epitaxial high temperature superconductor (HTS) thin film for electric power transmission . In the IBAD process, materials with rock-salt structures such as MgO are deposited on amorphous layers on polycrystalline substrates, with simultaneous ion beam bombardment. Under appropriate conditions, within a first few nanometers of the film, a good degree of biaxial texture is achieved. The degree of biaxial texture can be improved to about 2 - 3 degrees grain to grain misorientation over the entire film by homo-epitaxial and hetero-epitaxial film deposition atop the IBAD layer. An excellent performance is achieved when HTS films are grown epitaxially on IBAD templates. The architecture of the multilayer structures that are synthesized and investigated in our group is shown in the following figure. As shown in the Figure, a metal alloy substrate or a ceramic with a high melting temperature and capable of withstanding the high process temperatures is used. A key layer is the enabler, biaxially-textured film made by IBAD. A series of epitaxial films with a graded structure will follow ending with a cap layer that has excellent lattice match with the Ge film. GaAs and other III-V compounds can be then epiaxially grown in the single crystalline-like Ge layer. This approach enables a way to fabricate high quality, near single crystalline III-V photovoltaic films on flexible, polycrystalline or lattice mismatched substrates. Success of program will enable high efficiency photovoltaic thin films at a significantly lower cost and at a high throughput. We have already obtained promising results in preliminary work on epitaxial deposition of Ge on IBAD MgO templates on flexible metal substrate using intermediate buffer layers. Details can be found in reference 8. Ge was grown by magnetron sputtering on a CeO2 buffer layer on the IBAD MgO template. XRD theta-2theta pattern obtained from such an architecture shows the presence of a single orientation of CeO2 (200). Also, a strong Ge (400) orientation is seen. No evidence of Ge (111) is present. A clear four-fold symmetry can be seen in the (111) polefigure of Ge indicating a good in-plane texture. In-plane texture value of 6.6 degrees is measured in the Ge film which is comparable with that measured on epitaxial oxide films deposited on IBAD MgO. 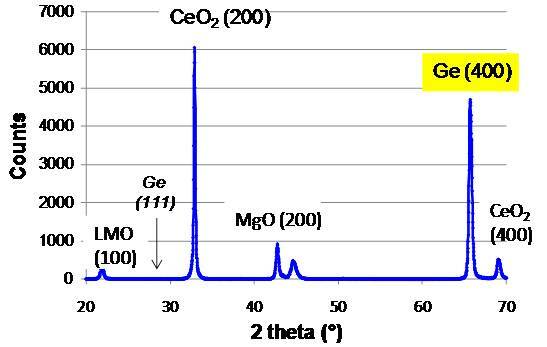 Indices of refraction and extinction coefficients measured from Ge deposited on IBAD substrate match well with that of single crystalline (001) Ge which indicates good quality of the Ge film on IBAD substrate. Indices of refraction (n) and extinction coefficient (k) measured from Ge deposited on an IBAD substrate. 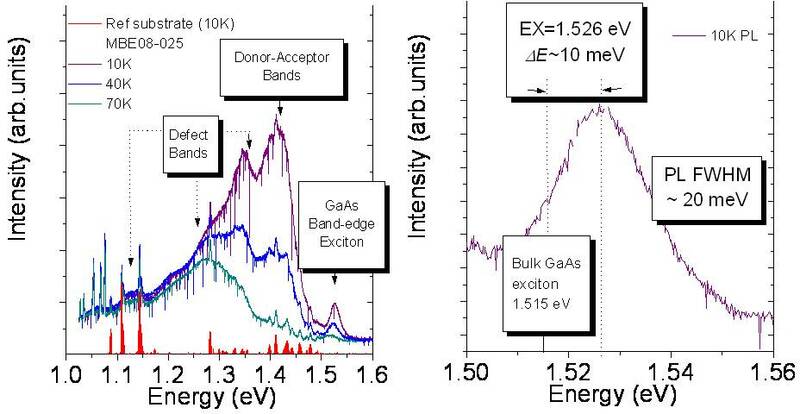 Next, GaAs was successfully grown epitaxially on Ge on IBAD template on metal substrate by molecular beam epitaxy (MBE) by our collaborator Prof. Alex Freundlich's group at the University of Houston. RHEED patterns were obtained in our preliminary work during the initial stages of growth of GaAs on Ge-coated IBAD substrates. The GaAs RHEED 2�4 pattern suggests self annihilation of antiphase boundaries and the growth of a single domain GaAs. 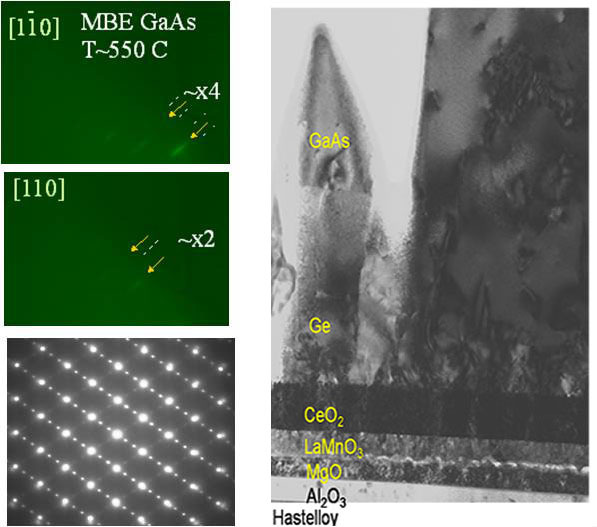 TEM cross section of the complete stack of layers of GaAs/Ge/CeO2/MgO/Y2O3/Al2O3/Hastelloy substrate show defects within the GaAs layer. 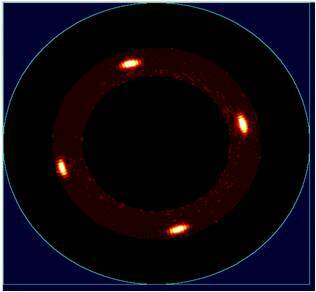 Electron Diffraction pattern obtained from GaAs on IBAD-based substrates shows a good epitaxial growth of GaAs. Data from high resolution X-ray diffraction of GaAs on Ge on IBAD templates indicates a high threading defect/dislocation density of 3 to 5 times 10^8 cm^-2. It should be noted that defect densities are derived from the Scherrer formula assuming that the broadening of the diffraction is entirely due to 60� threading dislocations. If one takes into consideration the possible curvature of the flexible substrate (see figure below) the actual dislocation density may be significantly lower. Nevertheless, a high defect density would limit the minority carrier diffusion lengths (<1 micron) leading to a severe performance degradation in a typical 3 - 4 micron-thick III-V solar cell. In order to overcome this technological roadblock, we are developing multiple solutions to achieve low density of defects as well as defect tolerant solar cell designs for high-efficiency, low-cost III-PV on flexible metal substrates. R. R. King, C. M. Fetzer, K. M. Edmondson, D. Law, P. C. Colter, H. L. Cotal, R. A. Sherif, H. Yoon, T. Isshiki, D. D. Krut, G. S. Kinsey, J. H. Ermer, S. Kurtz, T. Moriarty, J. Kiehl, K. Emery, W. K. Metzger, R. K. Ahrenkiel, and N. H. Karam, Proc. 19th European PVSC, 3587-3593 (2004). F. Dimroth and S. Kurtz, Mat. Res. Soc. Bull., 32, 230 (2007). J.Y.W. Seto, J. Appl. Phys. 46, 5247 (1975). R. Bergmann and T. Rinke, Prog. Photovolt. Res. Appl. 8, 451 (2000). W. Choi, A. T. Findikoglu, M. J. Romero and M. Al-Jassim, J. Mater. Res., 22, 821 (2007). J.R. Groves, P.N. Arendt, H. Kung, S.R. Foltyn, R.F. DePaula, L.A. Emmert, and J.G. Stover, IEEE Trans. Appl. Superconduct. 11, 2822 (2001).